Manchester United midfielder Bastian Schweinsteiger will be banned for three matches after accepting a Football Association charge of violent conduct. 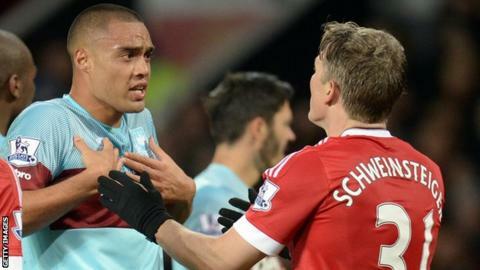 He was charged after catching West Ham's Winston Reid with his left arm as they waited for a free-kick in Saturday's 0-0 draw at Old Trafford. Schweinsteiger, 31, will miss games against Bournemouth, Norwich and Stoke, and return in time to play Chelsea. Referee Mark Clattenburg spoke to both players after the incident, but did not mention it in his post-match report. A panel of three former elite referees each reviewed the video footage independently of one another and unanimously decided it was a sending-off offence. "He knows what he's done - he's elbowed me in the face," Reid said following the match. West Ham manager Slaven Bilic said it was "a clear red card - a straight red without any doubts". He added: "It was a moment of madness. He deserved to be sent off, but the referee told me he didn't see it. Fair enough, I believe it. It was an elbow." Germany captain Schweinsteiger, who was part of their 2014 World Cup-winning side, joined United from Bayern Munich during the summer and has made 24 appearances for the club, scoring one goal.